Most recently, The Fry Gallery in Saffron Walden, Essex, hosted a major exhibition of Edwin Smith’s paintings, drawings, cuts and photographs from July 7 until September 1, 2013. The author of this site contributed paintings, photographs, woodcuts and artefacts for inclusion in this show. Details of the Edwin Smith collection at the Fry may be viewed on their website: Fry Gallery Edwin Smith Collection. In many of his drawings, and some of the paintings, one can see the influence that his photographs had on the subsequent non-photographic expression. Scenes and artifacts that are familiar from some of his classic photographs crop up in some sketches. The drawings, paintings and notebook pages shown on the Capturing Paradise page are a selection gleaned from various sources, including The Fry Gallery and some from my personal collection. It was perhaps only after Olive’s death that the full extent of her collection of Edwin’s paintings, drawings and engravings became known. Masses of unframed, often unfinished, drawings were sold at auction. Amongst them were some real gems, but they created little interest amongst buyers. Olive Cook wrote the text that follows to accompany the show and it conveys her devotion to the kind of work that Edwin may have been far happier to have been remembered by than his photographic output. A further exploration of Edwin’s non-photographic work, with the opinions of those that knew him personally, may be read in ‘Capturing Paradise:Edwin Smith’s Painting & Drawing, where you can also see a collection of paintings, drawings and sketchbooks. Edwin Smith was born in Camden Town and lived in London until 1962 when he moved to Saffron Walden. Trained as an architect, he is known as a photographer. His name appears on the covers of more than thirty volumes and his prints have been widely exhibited. But though Edwin prized the camera as the most exquisitely accurate means of recording perceived reality, he thought of himself as a painter, and was interested from the beginning in every form of visual expression. Despite his involvement with the camera and an almost total lack of response to his activities as a painter he produced a vast amount of work and completed at least two drawings during every day he spent at home. In the early days photography took up no more of Edwin’s time than one or two days a week and he was able to devote himself to painting and every form of print making. His knowledge of technique was astonishing and later he edited two important books on the subject. He loved all the materials and appurtenances of the painter and print-maker and throughout his life kept a collection of canvasses, boards, paper, powder colours, inks, pastels, brushes and pencils big enough to stock a shop. 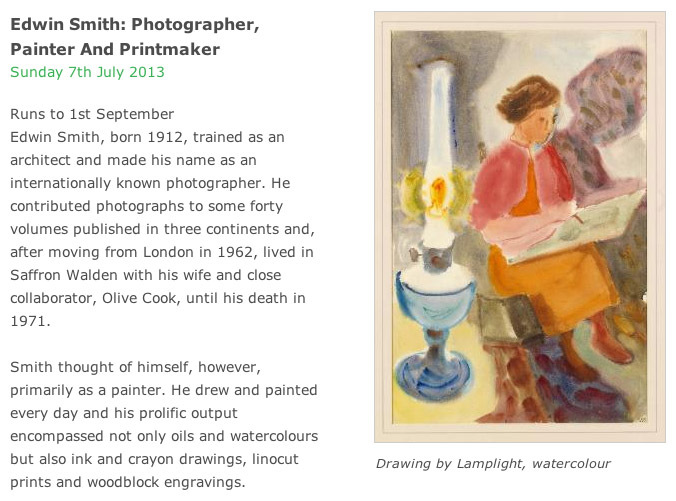 He surely must have been the only painter of his generation to own a mahlstick (though he never made use of it). 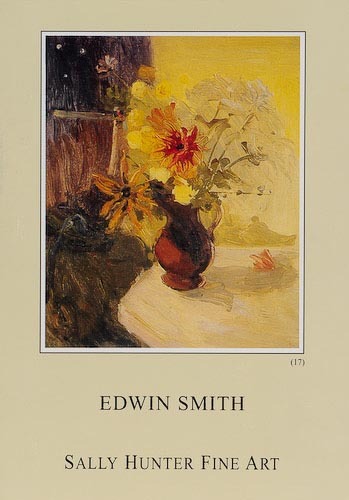 Since his death, Edwin’s reputation as a painter has been to some extent appreciated. An exhibition organised by Michael Chase at The Minories, Colchester in 1974 was followed by one at The Fermoy Art Gallery, King’s Lynn, in 1975. Edwin’s work was twice exhibited at House Gallery, London, and a number of drawings were shown at Clare College, Cambridge, in 1986. Four pictures were included in the exhibition of Neo-Romantic Art, “A Paradise Lost”, at the Barbican Art Gallery in 1987. The present exhibition consists of paintings and drawings which, with few exceptions, have not yet been seen. They show two aspects of Edwin’s work. Two of the drawings and most of the watercolours and some of the oils were done in front of the subject and, like the artist’s photographs, though more intensely expressive of his unique identity and more freely moulded by his imagination, wonderfully convey the joy and immediacy of the visual experience. In the more apocalyptic paintings and drawings, recollected images are transformed and irradiated by an inner vision. “God jogs my elbow”, Edwin would say, as he embarked on one of such compositions, never knowing what would emerge. One or two of Edwin’s many sketch books are on view in the exhibition and nearly all the drawings in them are of remembered images, sometimes faithfully set down, sometimes transfigured. A bound proof of Marcel Brion’s “Pompeii” for which Edward took the photographs can also be seen in the show-case. The text is missing and the blank pages gave Edwin the opportunity of confronting each of his photographs with a drawing expressive of his imaginative response to the subject. There could scarcely be a more striking demonstration of the difference in range and essence between painting and photography as artistic mediums. The exhibition is rounded off by copies of a limited edition of a small selection of the wood-engravings and lino cuts Edwin was making from 1933 onwards.